California will become the fifth state in America to allow physician-assisted suicide, after Gov. Jerry Brown signed the emotionally-charged bill on Monday. A lifelong Catholic and former Jesuit seminarian, Brown had refused to comment on the issue when it was being debated by the Legislature. What drove passage was the highly publicized case of 29-year-old Brittany Maynard, a California woman who moved to Oregon to end her life a year ago. In a video recorded days before her death, she told California lawmakers that "No one should have to leave their home and community for peace of mind, to escape suffering and to plan for a gentle death." The Catholic Church targeted Catholic lawmakers before passage and urged the governor to veto it. "Pope Francis invites all of us to create our good society by seeing through the eyes of those who are on the margins, those in need economically, physically, psychologically and socially," California bishops argued. The new law requires two doctors to determine that a patient has less than six months to live. The patient must submit two oral requests for a lethal prescription, at least 15 days apart, as well as a written request, which would be signed in front of two witnesses who attest that the patient is of sound mind and not under duress. Patients must be capable both of swallowing the medication themselves and have the mental capacity to make medical decisions. It is modeled after one in Oregon where last year 105 people took their lives with drugs prescribed by doctors. The American Medical Association states that "Allowing physicians to participate in assisted suicide would cause more harm than good. Physician-assisted suicide is fundamentally incompatible with the physician’s role as healer, would be difficult or impossible to control, and would pose serious societal risks." 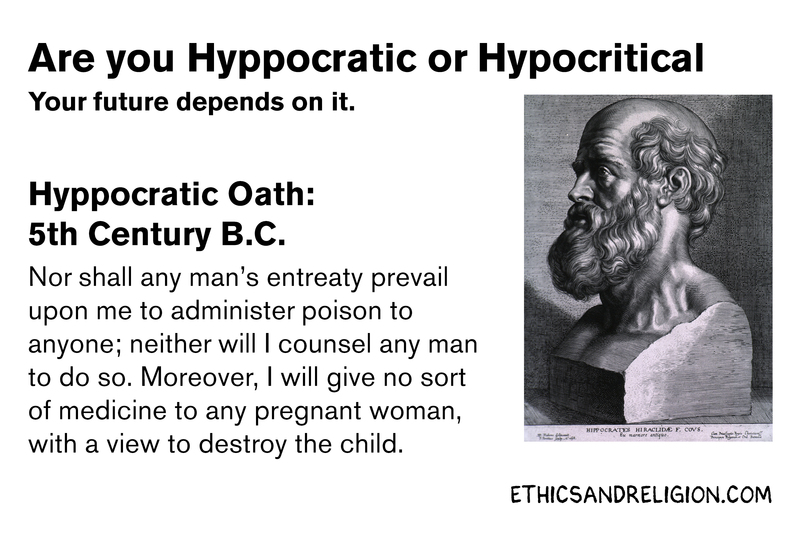 For 2,500 years, doctors have taken the Hippocratic Oath which proclaims, "I will keep (the sick) from harm and injustice. I will neither give a deadly drug to anybody who asked for it, nor will I make a suggestion to that effect." Ryan Anderson, Ph.D. of the Heritage Foundation, argues that "Allowing physician-assisted suicide would be a grave mistake for four reasons. First, it would endanger the weak and vulnerable. 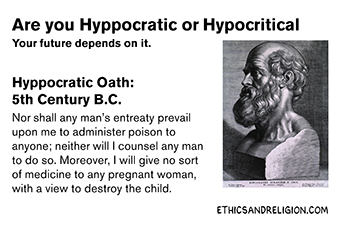 Second, it would corrupt the practice of medicine and the doctor-patient relationship." For example, it would provide perverse incentives to insurance providers and family members to end the life quickly to save money - a cheap, quick fix. "Third, it would compromise the family and intergenerational commitments. And fourth, it would betray human dignity and equality before the law." The temptation to view elderly or disabled family members as burdens will increase, and the elderly would begin to view themselves as burdens, as having a life no longer worth living. We would not be seeing this kind of a law, if abortion had not been legalized by the Supreme Court in 1973. The rationale for ending life at its beginning has led to a rationale for ending life when it is nearing its close. Rev. Dr. John Yates, Rector of my church, Falls Church Anglican, predicts that if one is free to medically end his life that "will lead one day to the idea that it is our responsibility to end our life if continuing to live seems to put unreasonable burdens on others around us. The right to die become the responsibility to die." Life is a precious gift from God. Each morning I awake thankful to God for another day of life, and for the beautiful world he has created, for loved ones such as my wife, our children and nine grandchildren. Only God should determine when and how life should end. "Those nearing the end of their lives need to know that they are valuable to us, that we believe it is good that they exist and good they are with us, and good we can be with them all the way to the end," concluded my pastor who has been at many death beds. There will come a time for each of us, when life cannot be prolonged. What ought to be given is palliative care in which medication is used to ease the pain and symptoms of disease- without attempting to needless prolong life itself. Three-fifths never heard of palliative care. Our lives should only be in God’s hands. Sadly, my state of Maryland is now considering physician-assisted suicide.